The old city of Ahmedabad has many stories veiled within its historic monuments. 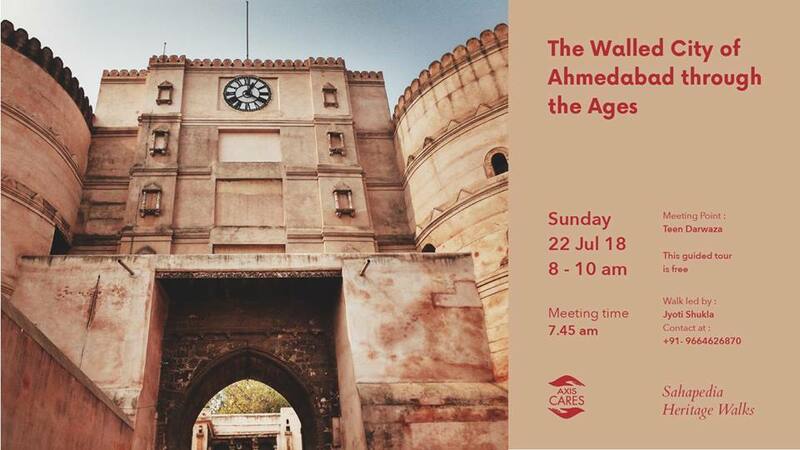 Walking through the different structures will help us identify the mark of different periods that includes Gujarat Sultanate, Mughals, Colonial era and post-independent time. Starting the walk from Lal Darwaza, we will be visiting Bhadra fort, Martyr monument, Ahmad Shah’s Mosque, Manek Buraj and Ellis Bridge. These spaces have been an integral part of the 700-year-old heritage leaving legacies behind. The narrow lanes, busy markets, various communities that exist along with it, will give us an insight into the rich diversity that the city has witnessed and sustained through the years. Come and let’s unravel the multiple layers hidden in the boundaries of the walled city. • For mandatory registration which closes after 25 entries. (Step-1- Please like & share the page to register. Step 2- Fill in the form to confirm your registration. If you are unable to attend the walk after having registered, please inform us over an email or a text message. Register only if participation is confirmed. One participation per registration. Please do not register twice. • Limited Parking space available at the meeting point and it will also be crowded. Public transport is advisable. • We will be entering religious places. Avoid sleeveless dresses or shorts/ half pant. Carry something to cover the head for the mosque. • Wear comfortable shoes, carry umbrella or raincoat and drinking water.